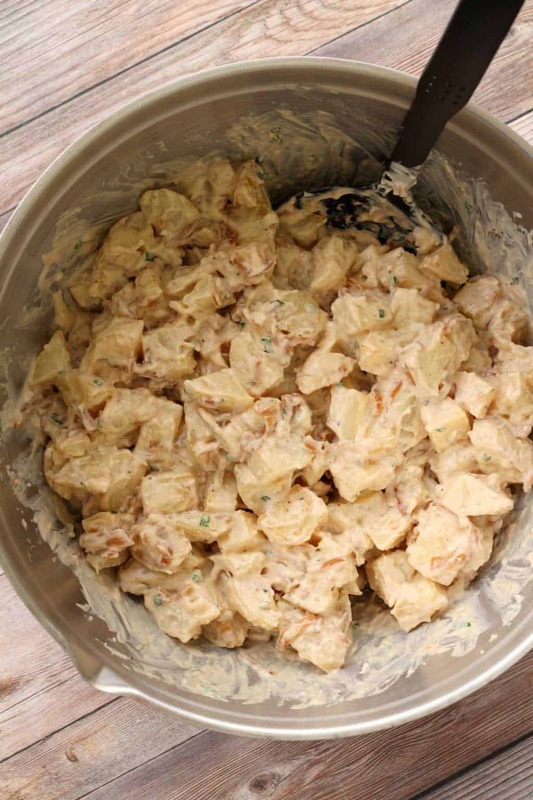 Vegan Potato Salad – Creamy and Tangy! 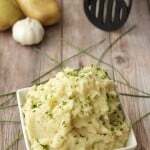 If you’ve ever been to a BBQ, and you probably have, then you’ve likely sampled the BBQ staple that is the potato salad! 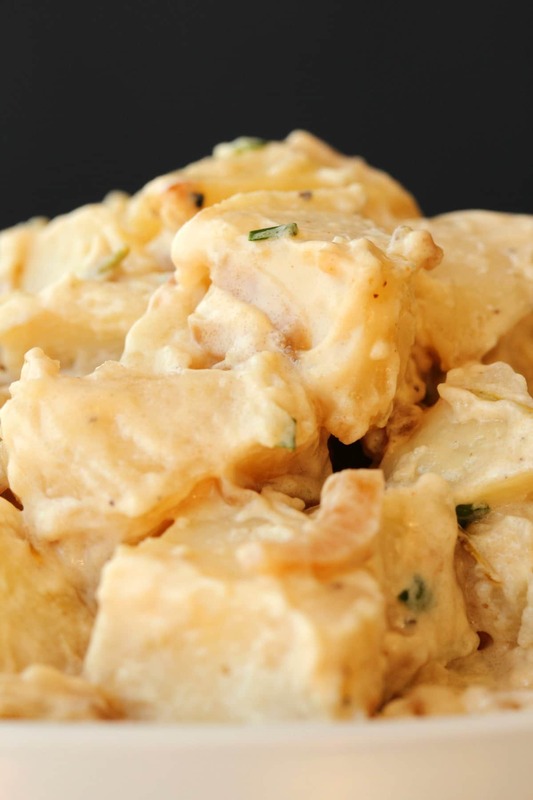 Usually one of the favorites, it’s seldom that there’ll be any potato salad leftovers for the next day! Being South African, we call a BBQ a ‘braai’. If you’ve ever been to South Africa then you know that the ‘braai’ is a HUGE part of the culture. It’s usually based on cooking meat outdoors, but hey, you can have a hell of a BBQ (or braai) as a vegan too. 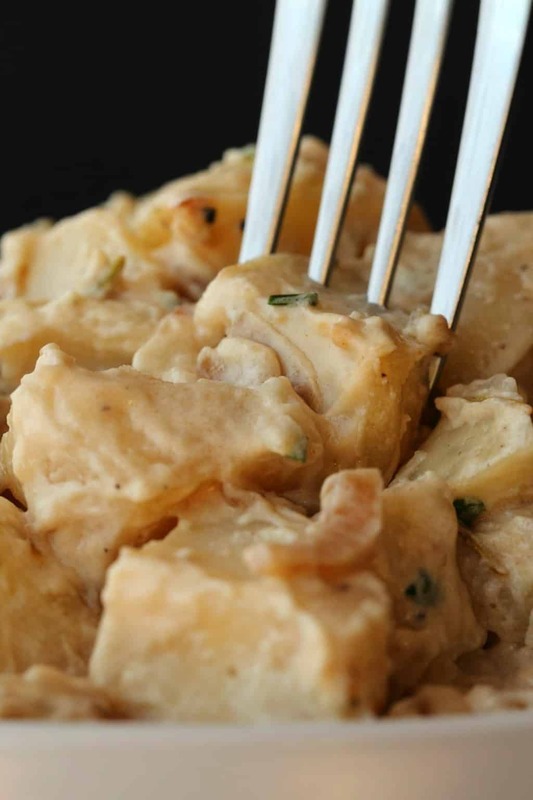 This vegan potato salad takes an old classic and makes it even better! And no one will even know it’s vegan (unless you tell them!). 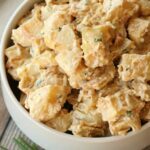 Just get out those veggie burgers or veggie sausages, throw together this fabulous vegan potato salad and you’re a hit. Warning: You will be invited to way more BBQs if you make this for friends, so be prepared for the social implications of this fabulous dish. 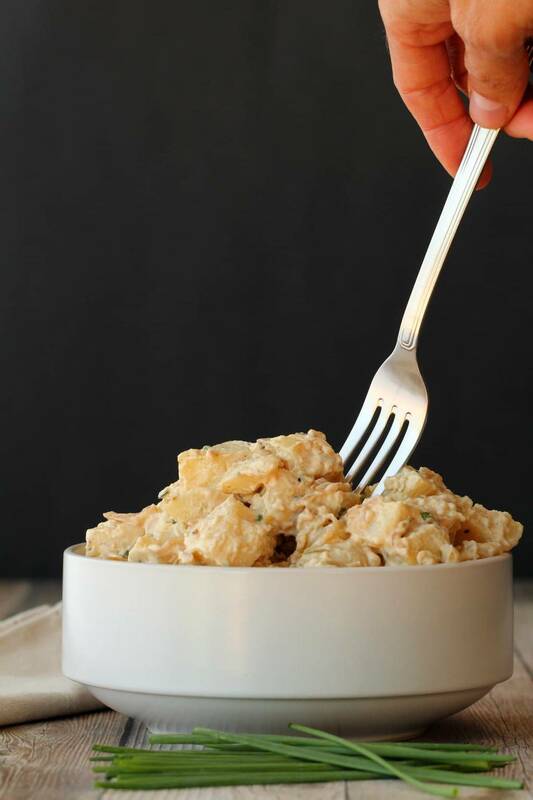 You will love this vegan potato salad, it is everything you ever want a potato salad to be! 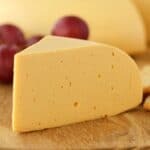 Creamy, tangy, perfectly flavored and deliciously textured! And making it couldn’t be easier! 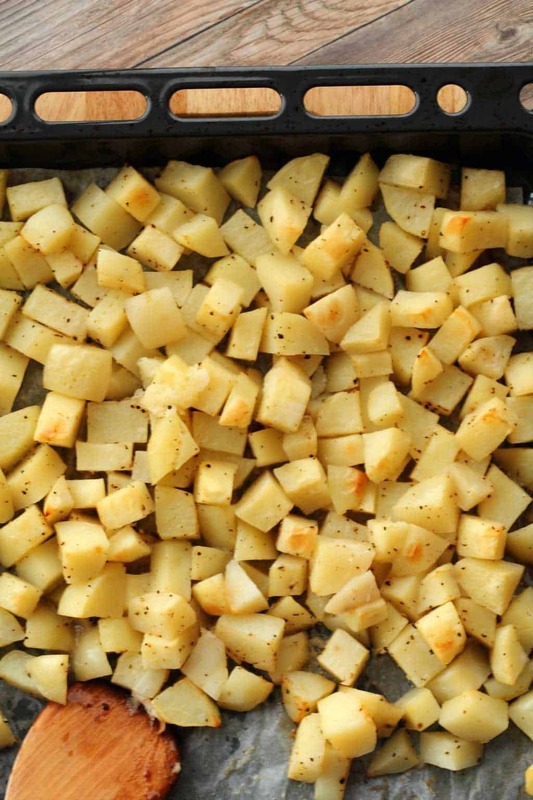 Peel and chop some potatoes, toss them in some olive oil and salt and pepper, get those roasting in the oven nicely and while that’s going on, you fry up some onion and garlic in a delicious marinade of soy sauce, maple syrup, dried rosemary and liquid smoke. 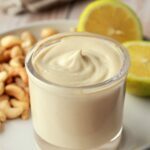 And then you throw together some vegan mayonnaise, dijon mustard, and white vinegar and whisk it together. Add in the sticky onions and some chopped chives. 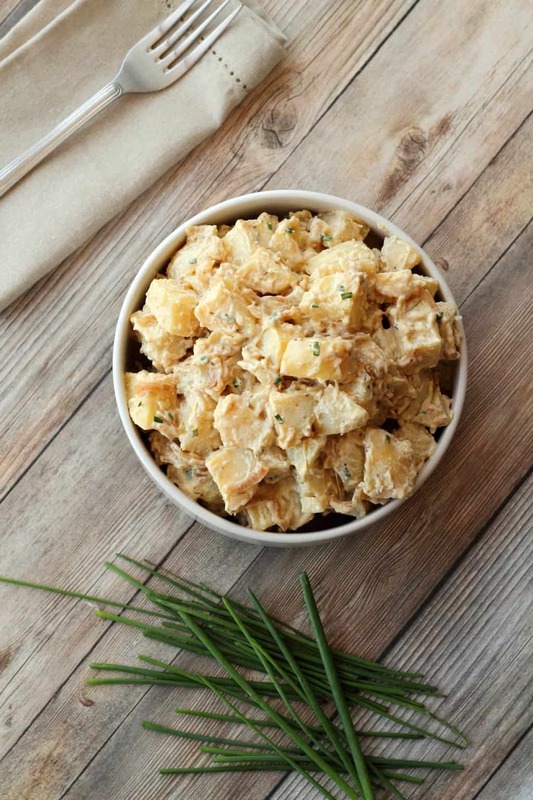 Add in your potatoes and gently fold it all in together and you have yourself the most divine vegan potato salad! 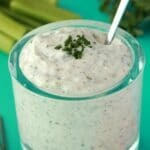 Enjoy it at BBQs or picnics or wherever a potato salad is needed (i.e. pretty much anytime!). 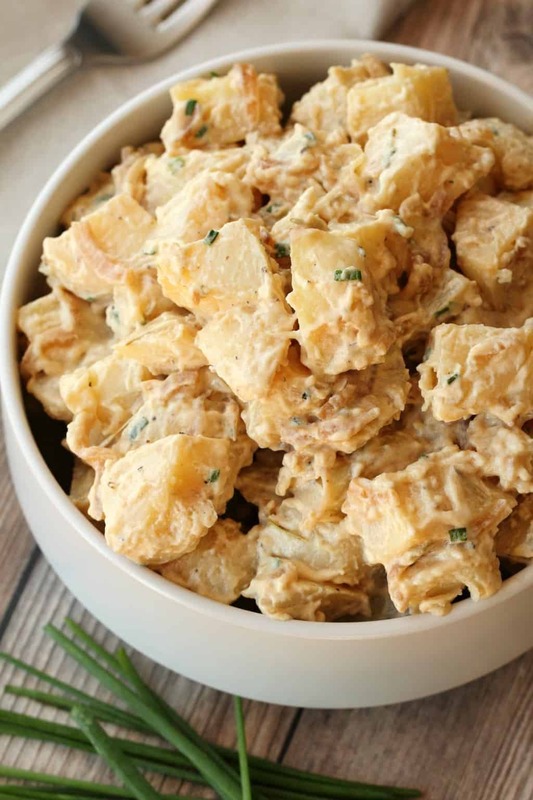 So let us know what you think of this vegan potato salad in the comments, and rate the recipe too please! Thanks so much! 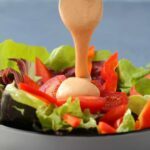 For more delicious salad recipes, check out these great options! Sign up to our email list for an awesome (and free!) 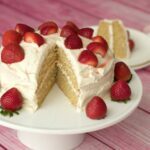 recipe ebook containing 10 great recipes, and you’ll stay updated with all our latest recipes posted to the blog. 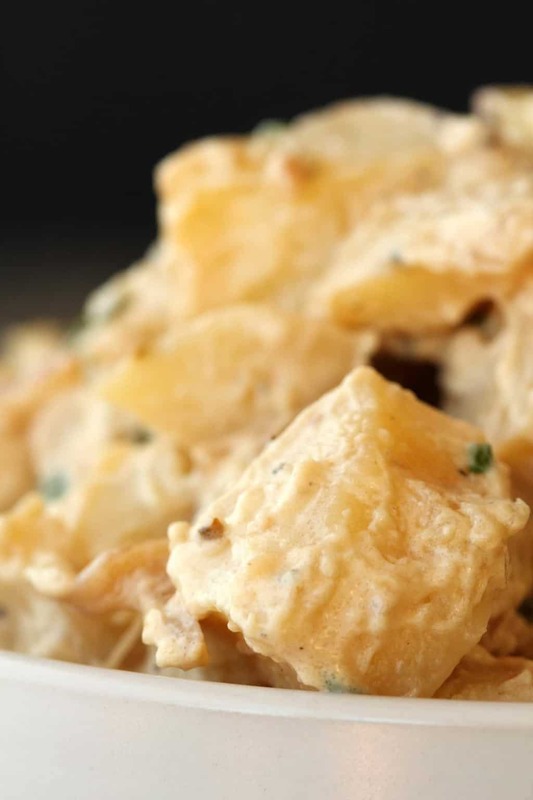 Creamy tangy and satisfying vegan potato salad. 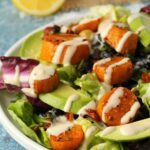 This vegan take on a classic dish will make you very popular at the next BBQ! And no one will know it’s vegan unless you tell them! Peel and chop the potatoes and then add to a bowl with the olive oil and a sprinkle of salt and pepper and toss together until lightly coated in the oil. 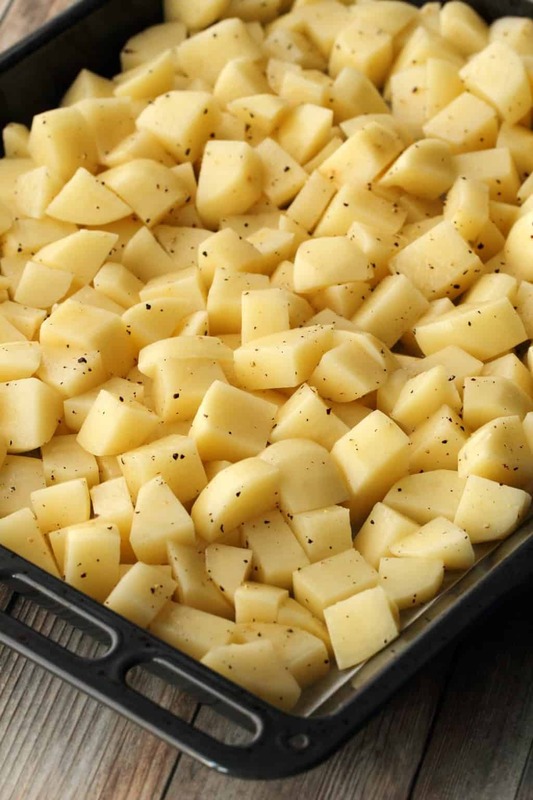 Place onto a parchment lined baking tray and bake in the oven at 390°F for 35 minutes until perfectly roasted. Remove from the oven and leave to cool. 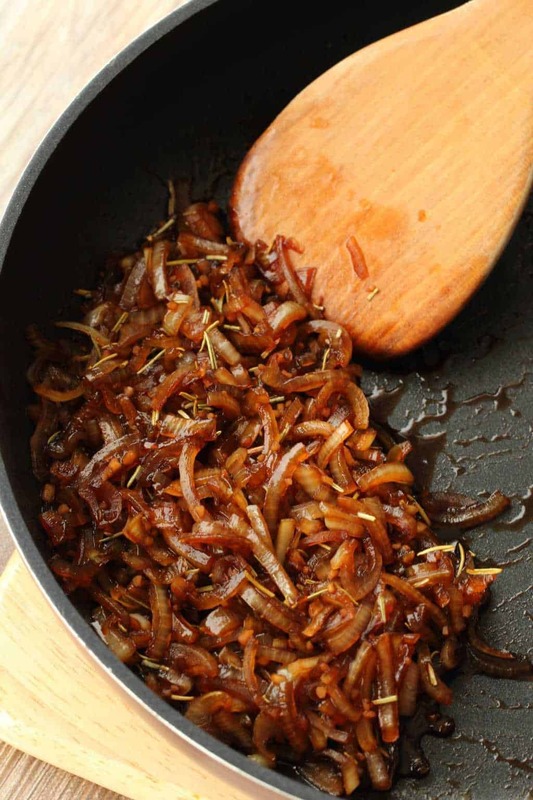 While the potatoes are roasting, chop the onion and add to a frying pan with the garlic and olive oil. Add the soy sauce, maple syrup, dried rosemary and liquid smoke. 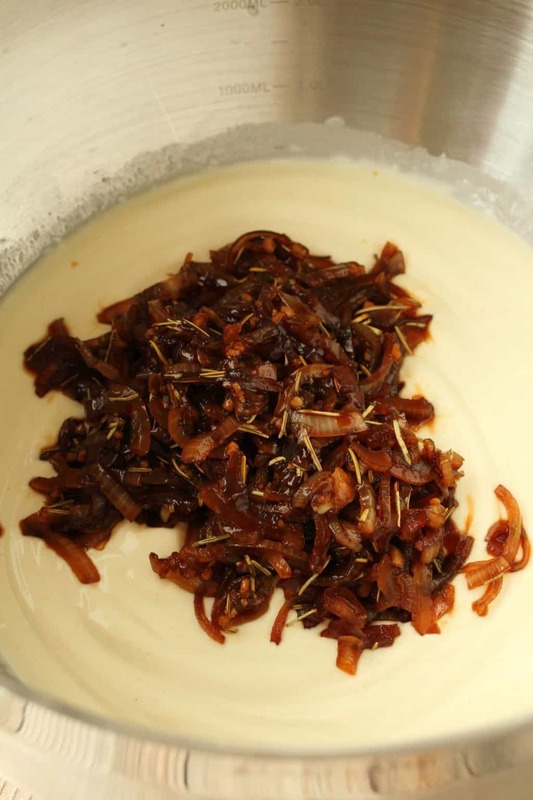 Fry until the onions are soft and the sauce is sticky. Remove from heat and set aside. 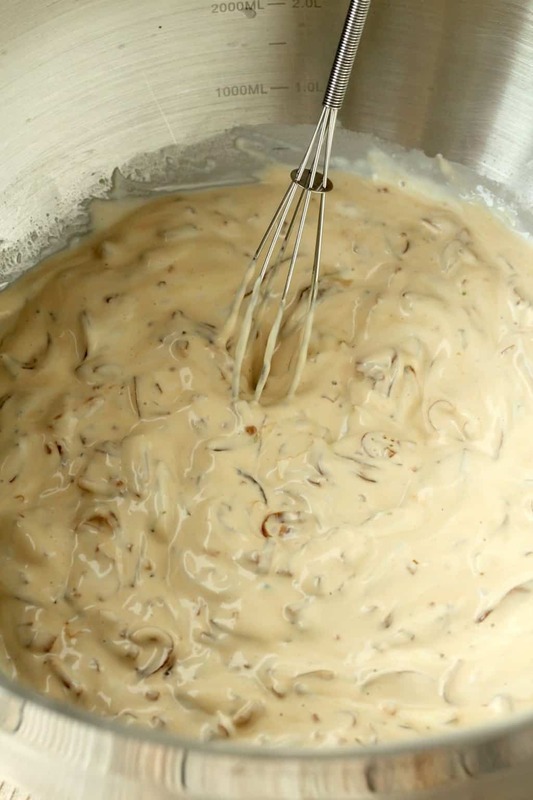 Add the mayonnaise, dijon mustard and white vinegar to a bowl and whisk together. Add in the onions and chopped chives. Add in potatoes and gently fold together, taking care not to break up the potatoes. *Nutritional information is based on 1 serve of 8 which is a generous serving. 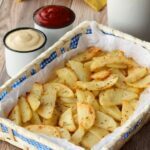 Baked Potato Fries – Garlicky and Delicious! 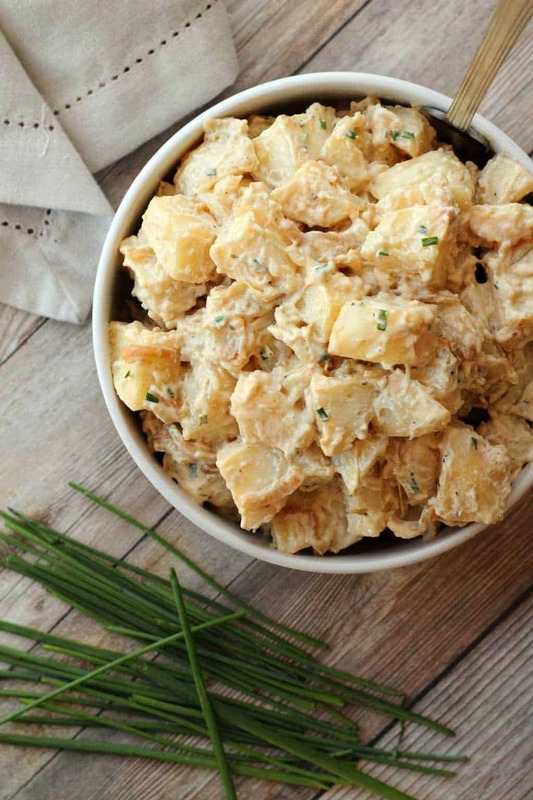 I love this potato salad. It’s totally perfect. Best ever BBQ side! It was delicious! 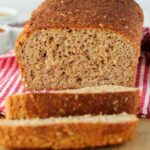 A really good makeover of a classic braai item. This was the greatest potato salad I have ever had…not greatest vegan, or greatest veggie, the greatest ever. 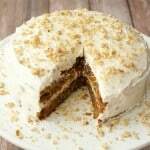 It was a huge hit and everyone wanted the recipe. Thanks! 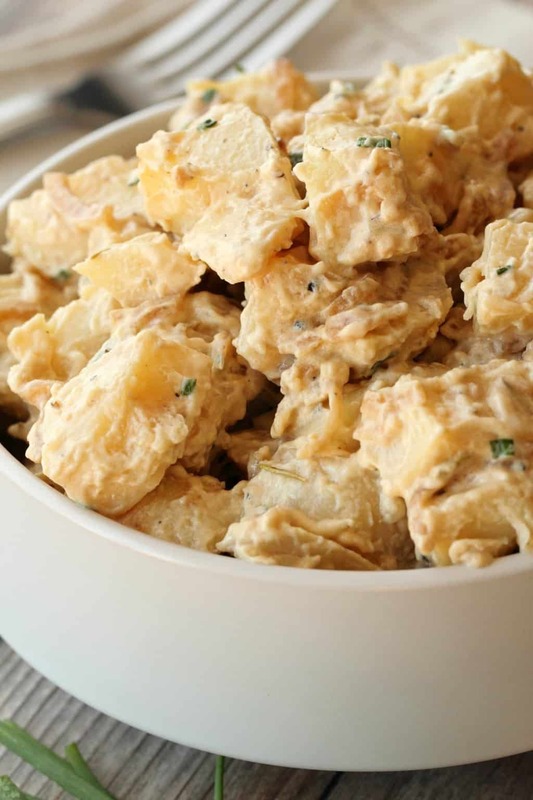 I can’t wait to make this, Ive been craving potato salad for ages, and all of the recipes on your blog rock! Thanks a bunch for making vegan food easy and fun with your stories and pictures. I love this blog! Thanks so much Taylor! So happy you like the blog. 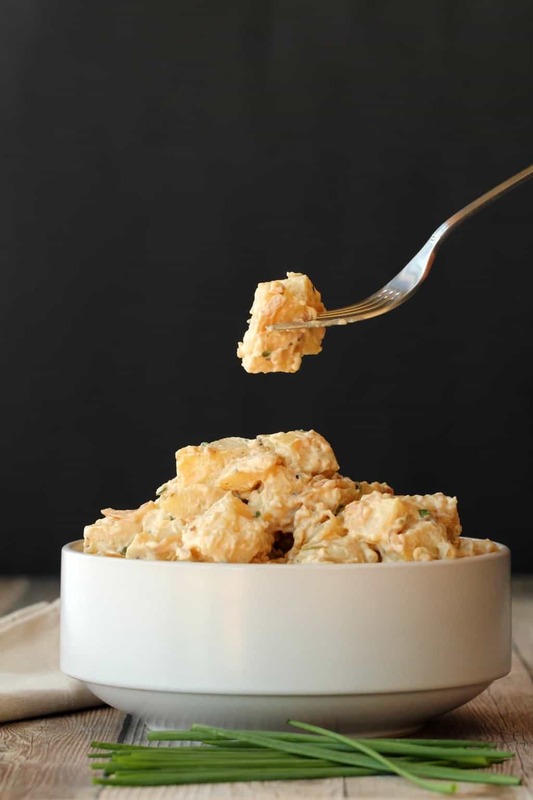 🙂 Hope you’ll love this potato salad. You can serve it right away and it is totally delicious. But you can also refrigerate and serve later when it’s cold, either way is really good.